The business sign is the basic link to customers in 98% of all US retail businesses. You’ve spent time picking out just the right location for your business, whether it is a new business or a new location for your existing or expanding business. That attention to detail should not end with just finding the perfect new spot! Now you need to bring your customers to your new front door. How will you lure them in? What type of sign will you use to attract new customers or let your existing customers know where you are? There are many options when it comes to building signs for your business and we can work within your budget. In a ten-year survey of businesses that recently put up a new sign and their first-time customers, it was found that almost half the customers said they learned about the business because of the sign, and not by way of the traditional advertising methods such as newspaper, TV, radio or word of mouth. Sometimes you might be limited by covenants or municipal rules that constrain the materials or size. Our creative team has plenty of experience with this and can help work within these boundaries and still provide you with a sign that will get your business noticed. Pinnacle Custom Signs can help you with all your exterior signage needs. We offer a full spectrum of outdoor signs that will get your business noticed as potential customers drive past your facilities. However, don’t let this limit your ideas as to how we might be able to help you. If you have an idea share it with us and then let us do our magic. We offer free consultations and on-site surveys and will be happy to work with you to help bring your customers to your front door. Let us help you with determining the optimal signs for bringing customers to your building. If you’d like for us to contact you about your outdoor signage needs, please complete the form below. 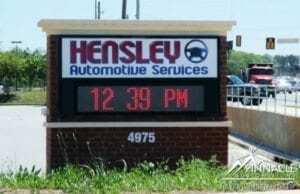 Or, you can call (678) 714-8700 and let us see how we can help with your outdoor signs. Remember that a business with no sign is a sign of no business. Outside signs and inside signs share many traits. For example, you can use dimensional lettering for a lobby sign and for a building sign. The differences in indoor and outdoor signs are due to the environment they are in. Outdoor signage uses materials that are proven to hold up while under environmental strains, like rain, window, and corrosion. They serve the important goals of increasing brand recognition, directing visitors to your location, and providing key information. However, more these signs have more restrictions than other signs. Here are some of the common types of signs and sign restrictions. Dimensional lettering can reference several different types of signs. Channel letters on top of a light box. Channel lettering is the most common form of dimensional lettering and is most often lighted in some fashion. The most common type of outdoor signage, channel letters are widely used because of their visibility and cost-effectiveness. They can be internally lite using LED lights or back-lit or both. Neon lights are rarely used due to the greater efficiency and light output of LED lighting. Dimensional lettering that isn’t lighted is also used and has a similar visual impact as channel letters, but they are not internally illuminated. You can combine channel letters with other sign frameworks to create unique looks. 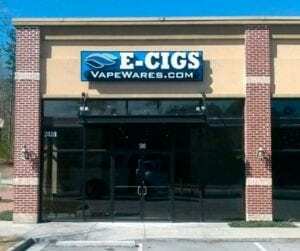 For instance, this outdoor business sign for Vape Wares combines a sign box and channel lettering. Monument and marquee signs are the most common type of road-side signage. Monument signs serve one significant purpose – letting people know where your business is. This may seem like a no-brainer, but non-existent or poorly designed signage can lead to frustrated customers and, at worst, delay the ability of emergency services to get to your location in the event of an emergency. 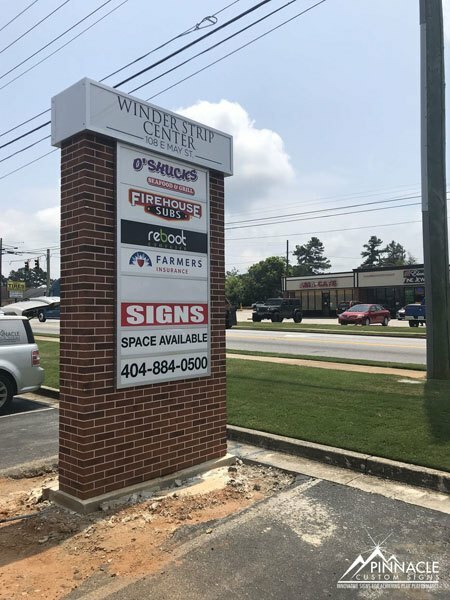 Businesses, subdivisions, multi-tenant developments – all need good signage. For more information, visit our monument and marquee page. A sign box incorporated into a monument sign with a digital display. Also called box signs, light boxes use internal lighting to illuminate the sign face which is usually a partially transparent vinyl on a flat acrylic surface. These signs are not as attractive as channel lettering but they are more cost-effective. As mentioned above, box signs are often used with channel lettering or other sign types to create a unique, custom sign design. They are often used on pylon signs and on the sides of buildings. Flat panel signs are some of the most diverse types of outdoor signs and are frequently combined with other sign types. You can use a variety of materials from real wood and metals to the more popular HDU. High Density Urethane is a type of polyurethane foam that is incredibly durable and versatile. Light weight but strong, HDU can be routed and painted to look like any other material, ie. wood and stone. Panel signs can be multi-level by incorporating dimensional letters on top of the sign face. They are most frequently used in monument signs and post signs. For more information, please visit our post and panel signage page. 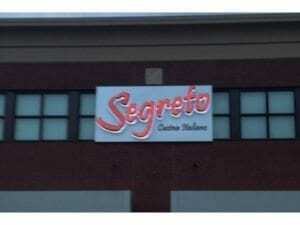 Backlit channel letters for Segreto. The biggest factor to consider when thinking about signage lighting is the type of business you run. Business-to-consumer businesses often have lighted signage because they want consumers to visit their location and see their location all hours of the day and night, and no matter what the weather conditions are. However, some businesses choose to only have their sign lighted during business hours to conserve energy and to signal that they are closed. Or, they may turn off their lighted building sign but leave the lighting for their monument or marquee sign on. 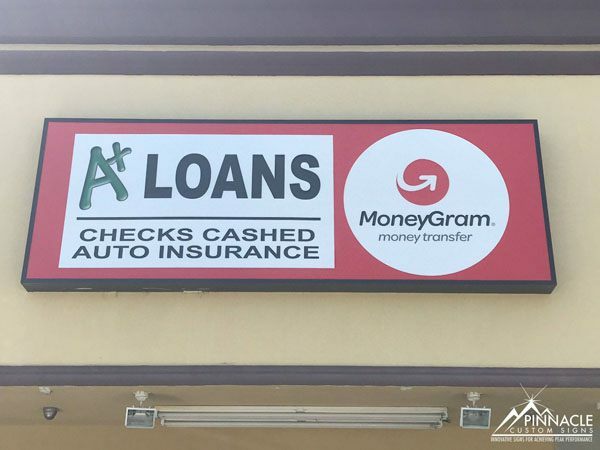 Either way, lighted signs are an extremely cost-effective method of advertising because it keeps your business identity in front of current and potential customers both day and night. Business-to-business businesses are more likely to have non-illuminated signage because there is no need to draw attention. For instance, a warehouse for a commercial construction company would only need signage for directing workers and delivery trucks. The signage that may be lighted would be key directional signage, not necessarily a large building sign. Another factor to consider is the landlord, developmental, and government restrictions. Some landlords or developments have strict guidelines on what they will and will not allow with signage. You should check with any local authorities to see what the restrictions are for securing a sign permit. Most outdoor signage needs to be permitted and that permitting process can take time. There is no set standard on how long it takes because of the complexity of the restrictions, and who places those restrictions, on signage. Many businesses lease a building instead of buying or building their own. This helps the business save a considerable amount of money but it also means they have to abide by some restrictions that landlord sets. For instance, signage. Landlords want to maintain property value and improve it over time, so they are going to want to restrict the types of signs you can use. This helps them keep a fairly consistent look while allowing each business to display their brand. How the building is constructed also plays into what signage you can use because of power access and mounting restrictions. Developments may also have requirements for signage, for instance, Atlantic Station in Atlanta, GA or 8000 Avalon in Alpharetta, GA. Both locations are mix-use developments with offices, restaurants, shopping, hotels, residential buildings, and parking. These developments are designed to foster a particular type of environment and community. The biggest source of sign restrictions is government but the restrictions vary depending on your location. For instance, your local city may have a requirement on the size of a sign and the general look of it. They want to foster a certain look and feel for their city, just like developers and landlords. If your local city is a suburb of a larger city, you may have additional requirements that carry over from that area. For instance, Atlanta has a requirement that freestanding signs must be able to withstand 150 miles per hour winds, no matter how tall the sign is. Sounds ridiculous because that’s Category 5 Hurricane strength winds and Atlanta does get hit by those, right? But Atlanta does get the occasional tornado. The strongest tornado to come through was an EF3 which has winds from 136–165 mph. As you can see, the restrictions will vary a lot depending on your location and any landlord and/or developers. We have worked with businesses across the country to get their signs designed, built, and permitted. Contact us today if you have any questions about the process! In August of 2013, we were contacted by Dianna Tuttle, Manager at AAlpha Mini Storage in Cobb County. She was looking for a local sign company that could help her out with various projects around the property. 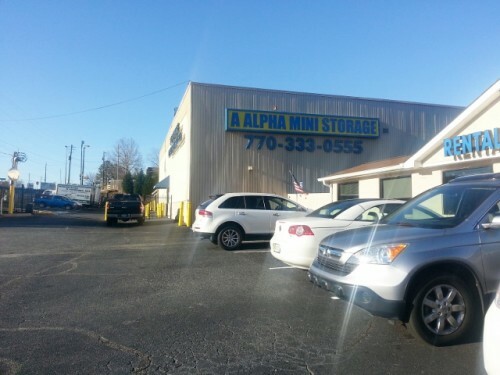 A Alpha Mini Storage in Smyrna, Georgia provides quality self-storage and storage supplies for businesses and residents of Vinings, Mableton, and Atlanta. They offer a choice of either conventional drive up storage or climate-controlled storage. Original sign – an old light box that had seen better days. After the first meeting with Dianna, all she wanted us to do was a very small banner for the street advertising free rent used to draw new customers. The banner was not that difficult and we quickly produced it for her and mailed it to her. Because of our promptness on this small project, she contracted us to do cut vinyl letters on all of her storage units. We were able to cut and install these letters with a quick turnaround time as well. 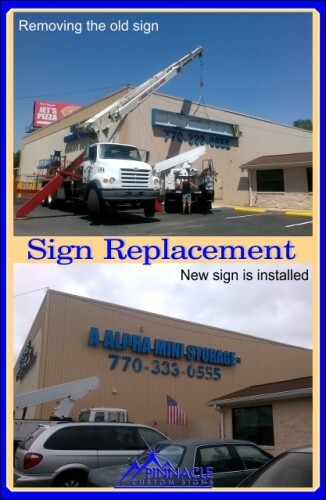 By demonstrating our dedication to service, we quickly became their “sign company”. In early January of 2014 we again met with Dianna and her boss, Norma Taylor, to discuss replacing her current lighted box sign. 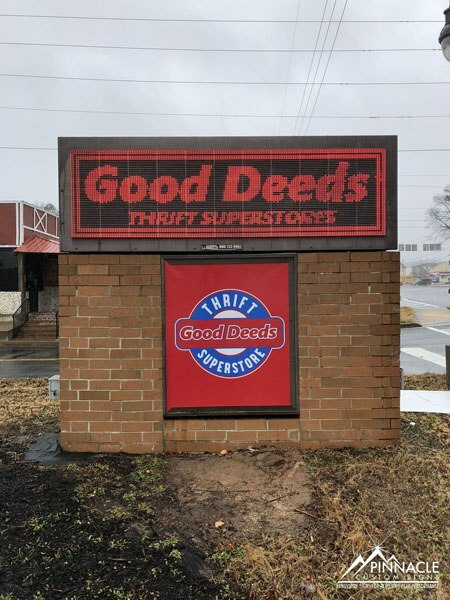 While they were changing out their sign, they wanted to update their look and make some renovations to the property, which was about twenty years old. Part of the overall project included painting the facility. Because of this, we had to coordinate with painters for both the takedown of the old sign as well as the installation of the new sign. When we went out to take the old sign down, we found it to be a solid welded steel box, which was over 32 feet in length. 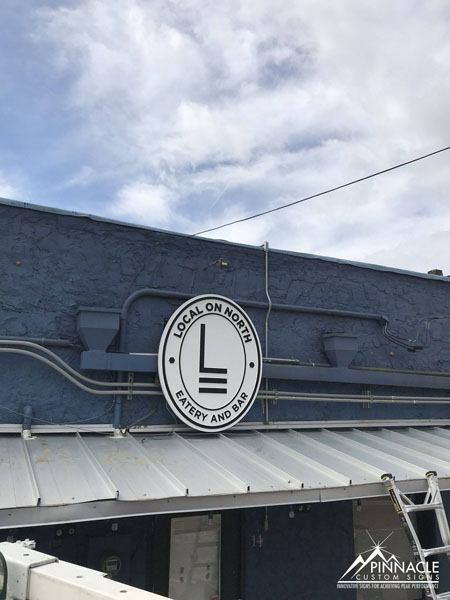 Our sign installer was not able to do it with his typical equipment and we quickly found out we would need to rent a crane to help us get it down. The old lighted sign box used fluorescent bulbs which tend to lose brightness and burn out over time. They were looking to change the box sign to channel letters for a cleaner look on the side of the building as well as to change the technology to LEDs, which burns much brighter and are much more energy-efficient. Once we got the sign down, the painters were able to paint the facility behind it and we were able to install the new channel letter sign for them. The new sign stands out from the facility and makes a bolder impression on customers as they pass on the street. 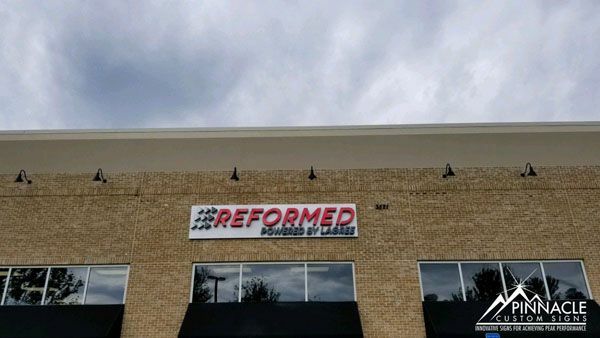 If you are looking to give your business a new look by changing out your building sign, we can help with the entire process. In October of 2013, we were contacted by AIMCO out of Denver Colorado, one of the largest owners and operators of apartment communities in the United States. As Property Operations is the heart and soul of AIMCO, they are dedicated to ensuring that every aspect of their communities is run professionally, with the utmost respect for residents’ happiness and safety. 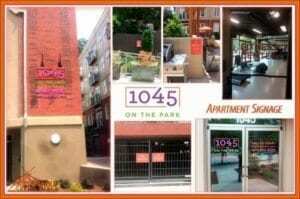 They had recently purchased an apartment complex on Piedmont Road in Midtown Atlanta called Park and 12th that they later changed the name to 1045 on the Park. Shortly after they purchased the property, we went down to do a site survey to see what signage needed to be updated in order to make the complex more appealing to residents. One thing we realized was that there was no outside sign identifying the property. Next, we noticed that they had a lot of windows that would be perfect canvases for window graphics. 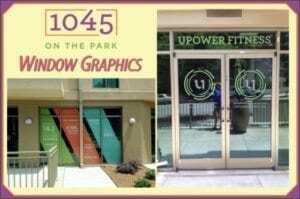 These window graphics could be a great way to relay important information and to give the apartments a high-quality look. Lastly, there were other signage throughout the property that were inconsistent. After the site survey was complete, we provided measures and ideas to Erica Garrity at AIMCO. We attacked the project from two fronts: the identity sign and the other signs that would be placed throughout the apartment complex. Working with the city codes of Atlanta, we determined that the only signs that were allowed in this residential area were wall signs without internal lighting. We decided that we would create a large identity sign routed out of High Density Urethane (HDU) and light it with indirect goose neck lighting. Erica and her team worked on a design that would fit that theme and concept. They also worked on the design for the other signs and window graphics. There were a few complications along the way as there were many rounds of revisions before the final versions were set. 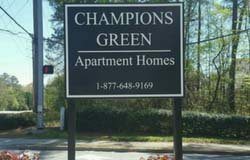 We were also delayed since AIMCO was trying to rename the apartments. The legal process bogged us down, and we did not get final approval until May of 2014. In June we performed all of the installations. Erica flew in from Denver to supervise, and the installs went out without a hitch and AIMCO was excited about the end results. This was a very large undertaking due to coordination with different entities in different states, the variety of signs, and the overall theme of the project. Largely, the project management of Joanne on our staff was instrumental in getting this all done. 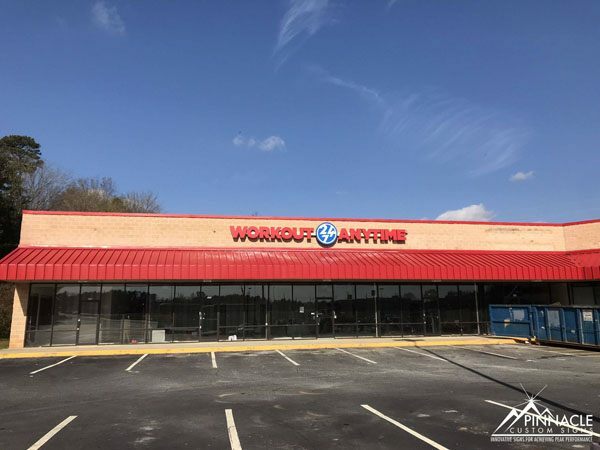 We look forward to working with AIMCO on future projects in the Atlanta area.